Studying human proportions is helpful in assessing the antecedents of disease, morbidity and death in adulthood. 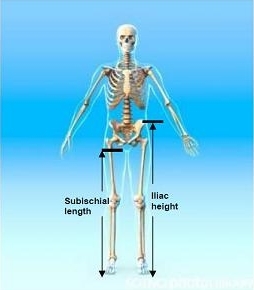 For example, human leg length (femur + tibia), sitting height (trunk length + head length) and their proportions, for example, (leg length/stature), or the sitting height ratio (sitting height/stature × 100), among others) are associated with epidemiological risk for overweight (fatness), coronary heart disease, diabetes, liver dysfunction and certain cancers. There is also wide support for the use of relative leg length as an indicator of the quality of the environment for growth during infancy, childhood and the juvenile years of development. For groups of children and youth, short stature due to relatively short legs (i.e., a high sitting height ratio) is generally a marker of an adverse environment. The development of human body proportions is the product of environmental x genomic interactions, although few if any specific genes are known. Sports biomechanics is a quantitative based study and analysis of professional athletes and sports' activities in general. It can simply be described as the Physics of Sports. In this subfield of biomechanics the laws of mechanics are applied in order to gain a greater understanding of athletic performance through mathematical modeling, computer simulation and measurement. For example gait analysis is used to assess, plan, and treat individuals with conditions affecting their ability to walk. It is also commonly used in sports to help athletes run more efficiently and to identify posture-related or movement-related problems in people with injuries. Anthropologists recently found fossil human footprints in northern Kenya, dating back 1.5 million years. This is the oldest evidence so far showing our ancestors walked in a similar way to human beings today. The impressions came from the Homo ergaster, or early Homo erectus, the first hominid whose longer legs and shorter arms corresponded to the body proportions of the modern Homo sapiens.